These chicken leg quarters are cooked to perfection in the oven with a delicious, fruity barbecue sauce. Pineapple and purchased barbecue sauce are combined to make the easy, flavorful sauce. 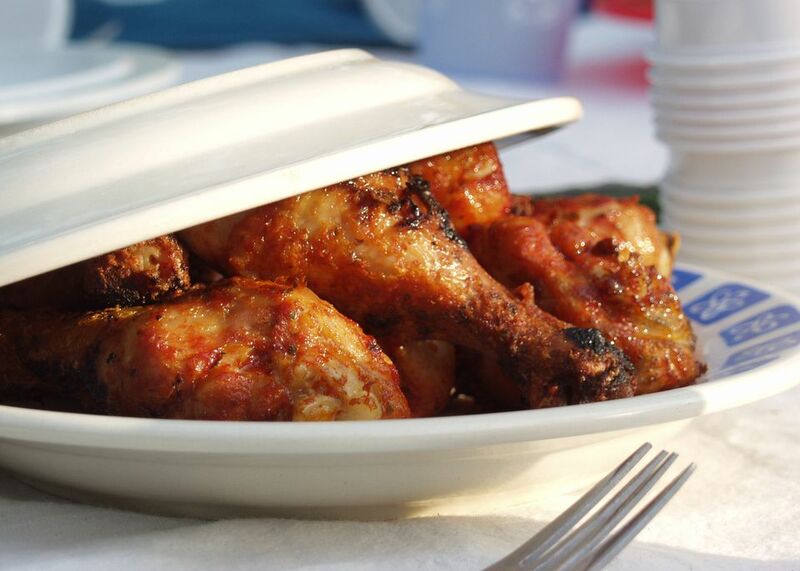 Serve these tasty chicken legs with rice and your favorite vegetable side dish or a salad. This is an excellent way to use whole chicken legs or leg quarters. The recipe is easily scaled up for a larger family or a crowd. Feel free to add crystallized ginger for extra flavor, or use about 1 teaspoon of ginger paste or fresh grated ginger. Heat the oil In a large skillet over medium-high heat. Add chicken pieces and cook, turning to brown all sides. Arrange the browned chicken in an 11-by-7-inch baking dish (or larger). Combine the crushed pineapple and barbecue sauce in a small bowl. Combine the flour and cold water in a cup and stir to form a smooth paste. Stir into the barbecue sauce mixture along with the ground ginger and candied ginger, if using. Bake in the preheated oven for about 1 to 1 1/2 hours, or until chicken is very tender and juices run clear. Baste with sauce occasionally while the chicken is baking.